Here are just a handful of outcomes to our successful campaigns. In 2012, AID/WATCH exposed the increasing spending of Australia’s aid budget on military activity in Afghanistan. Almost $200 million of aid money was spent on building military infrastructure such as checkpoints. This is not a proper use of aid money according to OECD guidelines, and is likely to cause harm to local communities, rather than promoting development. AID/WATCH produced research to support its critique of AusAID’s military program, engaged extensively with the media on this issue and testified at a Senate inquiry into the matter in December 2012. This is part of an on-going campaign by AID/WATCH to monitor how Australian aid money is spent and to promote expenditures that promote good development outcomes for intended beneficiaries. In cooperation with partners in Cambodia, AID/WATCH exposed an AusAID program that had led to the displacement of hundreds of people and prompted the near shut-down of civil society. ‘Off the Rails: AusAID and the Troubled Cambodian Railways Project’ exposed Australian companies benefitting from generous public subsidies to rehabilitate the railway whilst many of those in desperate need of aid dollars missed out. In response to AID/WATCH and other critiques, the Australian Government announced an Income Restoration Project (IRP). Whilst AID/WATCH criticized the lack of compensation, the IRP was a good first step. AID/WATCH is currently in arbitration with AusAID through the Office of the Australian Information Commissioner relating to a Freedom of Information request to release the social monitoring reports. In 2014, the Asia Development Bank’s internal watchdog admitted that the process had been botched and made recommendations for how to amend past errors. We are urging the Australian Government to take responsibility for this. AID/WATCH has long advocated against the ‘Reduced Emissions from Deforestation and Forest Degradation’ (REDD) schemes funded by AusAID in Indonesia and PNG. We have released publications, lobbied, and encouraged the public to write letters to parliamentarians. REDD offset schemes are ineffective in reducing carbon emissions, undermine the livelihood of subsistence farmers and displace forest-dwelling indigenous peoples. In June 2013, AusAID announced that the $47 million failed project would be discontinued. 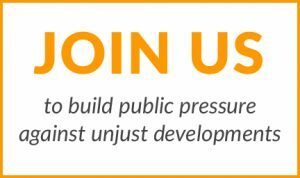 AID/WATCH has a long history of working with civil society organisations in the Pacific to promote sustainable development. In the past few years, we have worked with local partners in places like Vanuatu to defend customary land, which is a crucial element of the cultural and economic systems in the region. As a result of the combined efforts of AID/WATCH and tenacious advocates in Vanuatu, AusAID dismantled its ‘Mama Graon’ program in 2013, and replaced this with the Vanuatu Land Program, which is in line with current priorities of the Vanuatu Minister of Lands. Mama Graon was a surreptitious attempt to privatise land in Vanuatu, contrary to the country’s constitution. This privatisation was exposing local people to profiteering and exploitation by foreign investors from Australia, New Zealand and other wealthy countries. Its discontinuation will strengthen sovereignty and autonomy for the people of Vanuatu and provide a possibility for them to determine their own course to better development outcomes. AID/WATCH Revealed the real nature of the Federal Government’s aid package to Tsunami affected Aceh. Our report revealing the shortcomings and misrepresentation of the aid package resonated throughout the region. The corruption in the aid delivery as uncovered by AID/WATCH was quickly rectified by NGO’s and Government officials. In addition to this AID/WATCH was able to release a Tsunami Appeal Donation Guide within days of the disaster. The guide, distributed online, assisted the Australian public to make educated decisions about donating to aid agencies. In 2006 AID/WATCH’s Boomerang aid campaign paid off. The Federal Government’s commitment to the full untying of Aid has been long fought for. The untying of aid means that decisions about how to most appropriately spend aid money is in the hands of the recipient country and not Australia. The Government also announced a revision of the National Interest in Australian Aid giving. 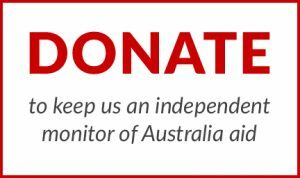 AID/WATCH will continue the campaign to expose the commercial and national interests in Australia’s aid program in their new campaign Real Aid Now! Raising public awareness and demanding accountability from International Financial Institutions (IFI’s) has resulted in a shift in the way IFI’s do business. By participating in and leading international NGO networks, advocacy and research projects AID/WATCH has been the Australian link in the global movement. Changes to the accountability and safeguard standards of development banks and the failure of the World Trade Organisation Doha negotiations are attributed to this work. Monitoring Australian aid in Papua New Guinea (Australia’s largest aid recipient) has built strong partnerships and is having an effect. The registration of customary land has been taken off the table, oil palm developments are being resisted and structural adjustment policies have been rejected. In 2004 AID/WATCH began their Land is Life campaign. The national speaking tour, linking of Australian Indigenous communities with PNG communities, research papers & photo exhibition have created awareness in Australia and deepened relationships between Australian & PNG communities. For environmental guidelines in Australia’s export credit agency EFIC (Export Finance and Insurance Corporation) was led by AID/WATCH. By bringing together other NGO’s on this issue, producing research, campaigning & negotiation pressure was put on EFIC. They adopted the guidelines AID/WATCH fought for. It meant that large scale development projects such as dams, roads & mines funded by EFIC had to comply with the new standards.